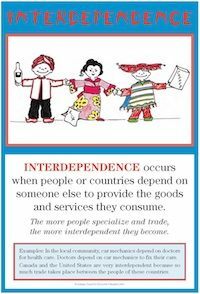 Interdependence occurs when people and countries depend on one another to provide each other's economic wants. Interdependence is the result of specialization. Everyone specializes to some degree since people depend on others to produce most of the things they consume. By specializing, people generally increase production and earn more income, leading to a higher standard of living. Specialization, and thus interdependence, also occurs in specific production processes. The most obvious example is assembly line production. Each person on the line depends on others to do his or her specific part. Schools and offices are also good examples of specialization and interdependence, with each person doing a particular job that contributes to the overall success of the organization's mission. As the economic systems of the world become more specialized and productive, people and countries are becoming more and more interdependent. This is an historical and economic trend that has continued over the centuries and seems destined to continue into the future. Discuss how people in families depend on one another. How has this changed compared to earlier times? How is it the same? Name several adults in the community that specialize in the production of a good or service (baker, teacher, etc.). Discuss how these people depend on one another. Take a walking tour of your school building. List all the specialized jobs you observe and write paragraphs explaining how interdependent the people are. (What would happen if the bus drivers decided not to drive the buses or the custodians didn't clean the school?) Illustrate your paragraphs with drawings. Participate in an assembly line to produce an item. Identify the separate operations and different tasks involved. Discuss how the workers are interdependent. What would happen if some workers didn't show up or didn't do their jobs well? Bring items from home that are produced in other countries. Make displays of these items. Work in groups and color the countries on a black-line map of the world. What patterns do students see? Write paragraphs beginning with, "People in different countries depend on each other because..."
Lesson 8: Interdependence - In this lesson, students use an assembly line to produce modeling clay hamburgers.